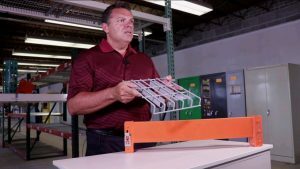 Today we’re going to talk about how to select the right wire deck for your pallet rack application. Check out the video and transcription below. If you’d like to start selecting your wire deck right now, visit our wire decking page. The most common wire decks on the market today are a full step cut channel wire deck and a flange channel style wire deck. While the full step channel gives more capacity, the flange channel gives you a lot more flexibility to use in different styles of rack. What Do Beams Have to Do with Choosing Wire Deck? Although we’re talking about wire deck, pallet rack beams are really one of the most important components to consider when choosing the correct wire deck for your application. First, it’s always important to know that not all pallet rack beams are created equal. You may see different widths on beams: on the top of the beam, on the bottom of the beam, and the step of the beam itself. It’s important to know what beam you have or what beam you’ll be selecting to be able to match it with the correct wire deck. It’s very important to know that beam profile you have when choosing the correct wire deck. The flange style wire deck will give you more flexibility to fit on different profiles of the same depth of upright. If you want a full step channel (which gives you the most capacity from your wire deck), we’ll ask you to take a measurement of the inside of the step on the front beam to the inside of the step on the rear beam. That measurement will identify the correct channel length that you will need for the wire deck to sit on the step of the beam. A lot of times we’ll say if you were going to cut a piece of wood to fit in that front beam to rear beam, what size would you cut that piece of wood? That will identify the correct channel length that will fit your specific pallet racking. The most popular style of wire decking is called a waterfall style deck. It’s called this because it “waterfalls” over both the front and rear beams. Also available is a single waterfall where the wire deck waterfalls over the front beam and then sits in the step of the rear beam. We also sell several other kinds of wire decks that are specific for different applications. One style is an inside waterfall where the water fall of the wire deck sits inside the step and is flush with the top of the beam. Another popular style is a drop-in wire deck. With this style, there’s no waterfall on the front or rear and the wire deck sets flush with the top of the beam. All four styles are available and in stock here at Warehouse1 and we can also special order any size as needed. We carry tens of thousands of wire decks in stock so we probably have what you need, when you need it. Contact us today and we’d be happy to help you.